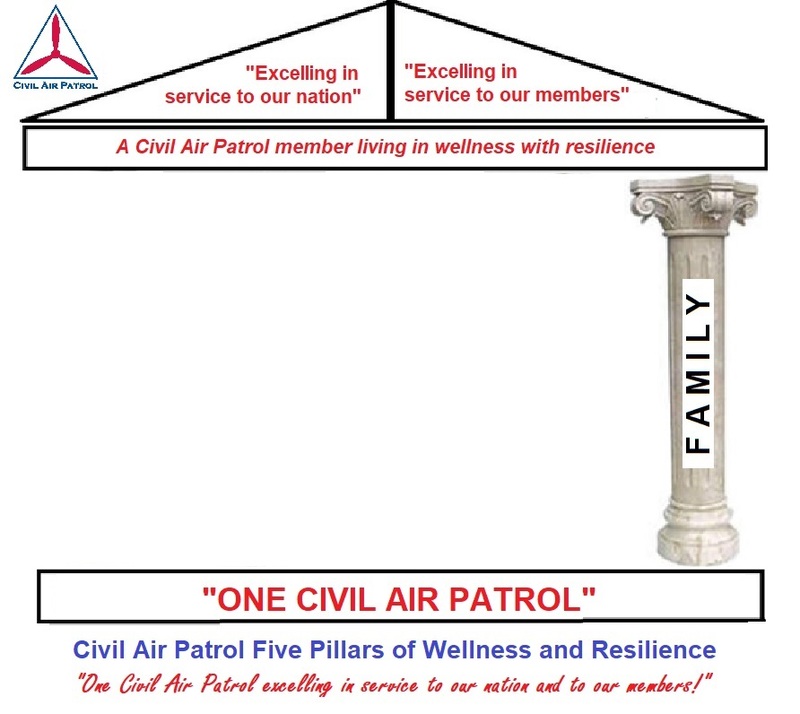 The fifth pillar of the Civil Air Patrol Five Pillars of Wellness and Resilience is the Pillar of Family. 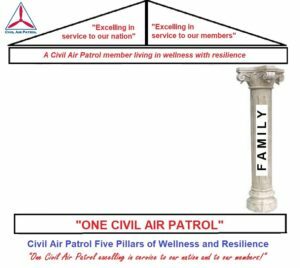 Chaplain Stu Boyd provides his perspective on the fifth of the new Civil Air Patrol Five Pillars of Wellness and Resilience — the Pillar of Family. Family has many different definitions. This concludes Chaplain Boyd’s series. Recall last September our Character Development Instruction focused on “Wellness and Resilience.” I wanted to expand on that by providing some specific ideas you can use to put that concept into practice in your life. 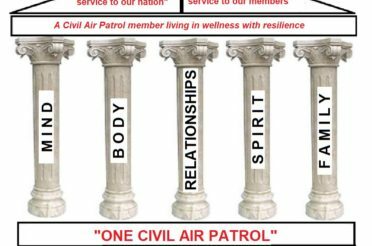 As you recall, the five pillars of Wellness and Resilience were: Mind; Body; Relationships; Spirit; and Family. 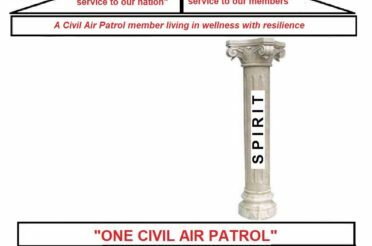 Together they supported an individual who was not only a strong, participating member of Civil Air Patrol, but a contributing partner in their community and the nation. Before I begin this last article, review with me the main themes we have covered so far. When we talked about the MIND, we focused on the importance of maintaining a positive attitude and developed some strategies to help that happen. The focus of the article on BODY was on how teens are much more susceptible to peer pressure. This in turn can lead to bad decisions in relation to things like drugs. The solution was to surround yourself with a group that ascribes to the same ideals and behaviors that you do. 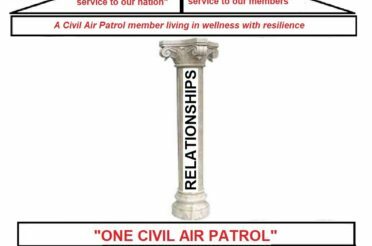 The third pillar was RELATIONSHIPS and we talked about how to manage conflicts within those relationships. 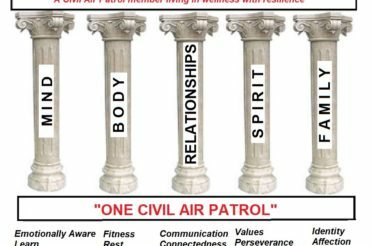 The last article focused on the pillar of SPIRIT and provided answers to these five questions: Who am I? Where did I come from? Where am I going? How shall I live? and Why? This group of men, mostly pilots, represented the best of American male society. They were all college graduates (many from the military Academies), were highly trained and together endured unbelievable physical, emotional and mental torture. They survived. Numerous research studies have been conducted to discover how and why. Most come to the same set of basic conclusions. They took care of each other as best they could. Most of the care was emotional since they have limited access to medical care, and many were kept in isolation. There was always leadership and structure. As the North Vietnamese would identify and isolate one leader, a new on would take his place. Each Sunday in his cell, each prisoner would face the East (the direction of America) and together would recite the Lord’s prayer and the Pledge of Allegiance. There was a spiritual component to their survival. You are not in prison camp. You are not being tortured. Your life is not in danger. So, what does all of this have to do with you? It has to do with the fact that you are best when you have FAMILY. Are you being cared for and are you caring for others? I would like to start with your nuclear family – your mom, dad, brothers and sisters, aunts and uncles, and on and on. They are there to provide you the — emotional and physical care that you need. You have a choice sometimes, especially as it relates to emotional care. You can choose to share your hopes, fears, desires, challenges — with them, or not. Emotional care is a two-way street. In most cases if you are willing to take the risk, they will be there for you. Today, however, you are filled with Instagram, Snapchat, Facebook and who knows what else. You can choose to share with people you may not even know or how do not care about you instead of your own family. Next, the prisoners communicated even if it might mean torture. Are you communicating with your nuclear family as well as your social and relational families? Again, that doesn’t mean texting or electronic chatting. It means sitting down, “eye-to-eye” and talking. Do you do family dinners or gather with a group for lunch? Do you go out of your way to include those who are not joining in? One of the things that helped the prisoners maintain their sanity and not turn on one another, was they were willing to turn to a leader—someone they recognized as “in charge.” In their case, they had a military structure to determine who that person was. 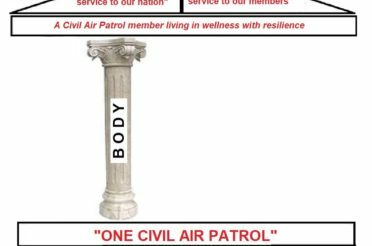 You are not military. How do you decide your authority is? Is it you parents? Is it a teacher? Is it a religious belief? Who is it? If you don’t have an answer it might mean you are thinking that you are in total charge. Often that can be a dangerous idea and can lead to bad decisions. Finally, they found unity in a spiritual focus. There appear to be a lot of reasons for today’s youth to reject organized religion. You hear thoughts such as “church-members are hypocritical,” “the church’s beliefs are out of step with society,” “I tried it and it was boring,” – there are dozens of well researched articles on why today’s youth are stepping away from organized faiths of all types. My question to you is, what is your alternative. We closed out the last article with a song from the Broadway Show, Carousal. The last line of the song was “You will never walk alone.” Are you walking alone? The prisoners never walked alone. They had each other. The cared a comforted their fellow man when he was hurting and down. They prayed with him. They never left him alone. To me that is FAMILY, to always have someone with you who will stand by you in the best and worst of times. Find your FAMILY and cling to it.